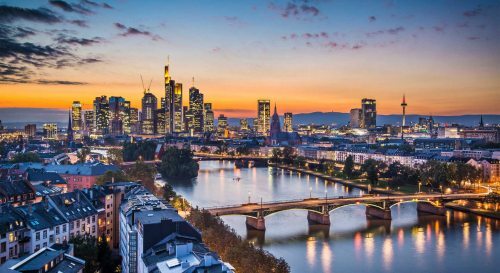 Lufthansa has dropped the price of their May and June 2018 flights from Vancouver to Frankfurt and Munich, Germany down to $750-$760 CAD roundtrip including taxes. The flights to Frankfurt are non-stop both ways. The flights to Munich are non-stop on the way there, and have 1 stop in Frankfurt on the way home. 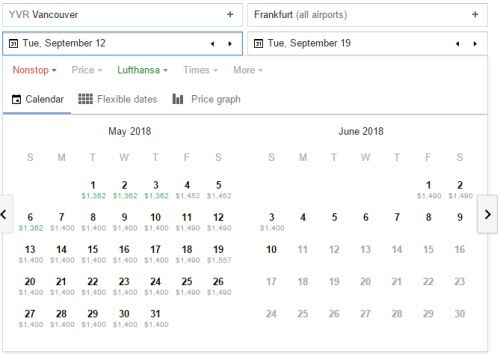 If you have a look on Google Flights right now, you'll see it's pretty common for these non-stop Lufthansa flights to be priced at $1300-$1400 CAD roundtrip. Lufthansa is often ranked somewhere in the top 10 of airlines worldwide. The second flight in the Skyscanner search results should be the one that is non-stop both ways. You can also find July 2018 dates for $50 more roundtrip. It's pretty rare to see July or August dates from Vancouver to Europe for $800 CAD or less. It's even more rare to see them on Lufthansa. vancouver, yvr, flight deals, europe, frankfurt, germany, fra, central europe, western europe, munich, muc and lufthansa. 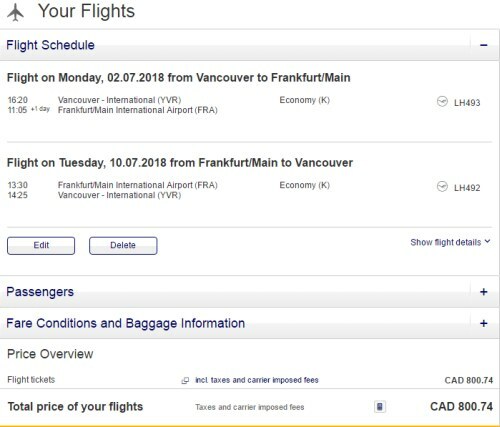 4 Responses to "Vancouver to Frankfurt or Munich, Germany - $750 CAD roundtrip including taxes | non-stop flights on Lufthansa in May and June 2018 (or July for $50 more)"
Hey Chris, you keep stating "including taxes" in all your postings. The Government has ruled for quite a few years, that advertised flight prices must be the tax-included price. All airfares should be tax included. It use to be in Canada you could find $1 flights with like $200 in fees, extras, surcharges and taxes. This infuriated Canadians, and laws were created to stop this nonsense. Yes, back when this blog first started, and before those laws came in to effect, I always stated 'including all taxes' on every post, because I hated the fact that airlines could essentially advertise any 'before tax' price they wanted to - and wanted it to be clear that I was referring to the total price including taxes. It's been a while since those laws came into effect, but these things can still take a while to sink into the public consciousness. I still get people asking if the prices include taxes! Hey Chris are these still valid? Cant seem to find that price no matter which date i choose. Unfortunately these ones disappeared yesterday, I will definitely update if they return!